NASA's Mars rover Curiosity has beamed home the first human voice ever sent from another planet, as well as some spectacular new images of its Martian environs. The 1-ton Curiosity rover broadcast a greeting from NASA administrator Charlie Bolden, who congratulated the mission team for getting the huge robot to Mars safely. While the significance of the audio accomplishment is largely symbolic, NASA officials hope it presages a more substantial human presence on the Red Planet down the road. "With this, we have another small step that's being taken in extending the human presence beyond Earth, and actually bringing that experience of exploring the planets back a little closer to all of us," said Curiosity program executive Dave Lavery, invoking the famous line late astronaut Neil Armstrong uttered from the surface of the moon on July 20, 1969. "As Curiosity continues her mission, we hope the words of the administrator will be an inspiration to someone who's alive today, who will become the first to stand upon the surface of the planet Mars," Lavery told reporters today (Aug. 27). "Like the great Neil Armstrong, they'll be able to speak aloud — in first person at that point — of the next giant leap in human exploration." Curiosity touched down inside Mars' huge Gale Crater on the night of Aug. 5, tasked with determining whether the Red Planet could ever have supported microbial life. For the next two years, Curiosity is slated to explore Gale and the crater's 3.4-mile-high (5.5 kilometers) central peak, the mysterious Mount Sharp. The $2.5 billion rover is outfitted with 10 different science instruments to aid its quest, including a rock-zapping laser and gear that can identify organic compounds — the carbon-containing building blocks of life as we know it. Curiosity's ultimate destination is the base of Mount Sharp, where Mars-orbiting spacecraft have spotted signs of long-ago exposure to liquid water. These interesting deposits lie about 6 miles (10 km) from the rover's landing site as the crow flies. The mosaic has Curiosity's scientists licking their chops. "I think when those of us on the science team looked at this image for the first time, you get the feeling, 'That's what I'm talking about,'" said Curiosity lead scientist John Grotzinger, a geologist at Caltech in Pasadena. "That is why we picked this landing site." While researchers are most excited about the potential discoveries that await them on Mount Sharp's flanks, the scenic beauty captured in the panorama got their hearts racing, too, Grotzinger said. The terrain "looks like it was something that comes out of a John Ford movie," he said. Though Curiosity took its first short test drive last week, it still hasn't strayed far from its landing site, which the mission team dubbed "Bradbury Landing" in honor of the late sci-fi author Ray Bradbury. The rover should be ready to head out in a few days, Grotzinger said — but Curiosity won't be going straight to Mount Sharp. Rather, the first stop is Glenelg, a site 1,300 feet (400 meters) away where three different types of terrain come together in one place. It'll likely take the rover a month or two to reach Glenelg, where it will spend another large chunk of time performing science operations. Curiosity could be ready to turn its wheels toward Mount Sharp by the end of the year, Grotzinger has said. But it'll take Curiosity a while to reach the mountain. The rover will probably cover a maximum of about 330 feet (100 m) per day after it's fully checked out, researchers have said. 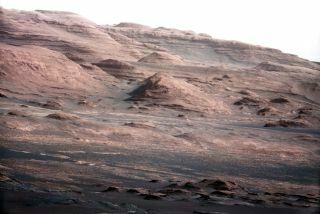 And it may stop along the way to Mount Sharp to study interesting landforms. "It'll probably take us a year to get there," Grotzinger said. Also today, Curiosity scientists announced that tests of the rover's onboard chemistry laboratory, SAM (Sample Analysis at Mars), are going well. SAM can detect organics in Martian soil, and it will sniff the Red Planet's atmosphere for methane, which may be a sign of life as organisms here on Earth are known to generate the gas. The SAM tests are part of an ongoing checkout of Curiosity and its science instruments, which has proceeded very smoothly so far. "Curiosity, as you've gathered by now, is a very complicated beast with lots of parts, and the project's being very systematic about testing things out," said SAM principal investigator Paul Mahaffy, of NASA's Goddard Space Flight Center in Greenbelt, Md. "We think of ourselves a little bit as the nose of Curiosity, and we're getting ready to start sniffing," Mahaffy added.